A Collection of Broadway's greatest hits sung by Kevin Gray, who starred in "The Phantom of the Opera", "Miss Saigon","The King And I", "Showboat", "Titanic", "Jesus Christ Superstar", and "The Lion King" on Broadway and National Tour. 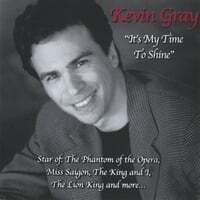 Kevin Gray’s “It’s My Time To Shine” is a collection of ten songs by Broadway performer Kevin Gray. Kevin has played some of the most prestigious roles in Broadway history. He has performed the role of “The Phantom” in “The Phantom of the Opera,” “The Engineer in “Miss Saigon,” and the role of “The King” in “The King and I” over 1000 times each on Broadway, National and International Tours, to name only a few. The CD was begun in February, 2006 and completed in 2007. During most of this time Kevin was performing as “Scar” in The Lion King “Cheetah” Tour. The CD contains songs from many of Kevin’s biggest roles, as well as 2 songs from “Dracula… The Covenant,” a new musical written by Kevin and Dodie Pettit, and two more songs written by Dodie Pettit. ”MAJESTIC SHOW IS SOMETHING SPECIAL”…. Gray has brought his own stamp to the king to complement the familiar shaven head and hands-on hips hauteur of Brynner ilk, duly playing him as sern, vain, yet always inquisitive and sometimes playful…..
”CLASSIC TALE WITH GLORIOUS STAGE SET”…the undeniable star was Kevin Gray, who gave the King a mesmerizing quality; his powerful voice communicated both a commanding presence and an irresistible denial of defeat, yet inspiring love. ”KING IS STILL SO DELIGHTFUL”……Kevin Gray, a wonderfully handsome King was hammering dialog and vocals with the sort of power you associate with someone in the days before personal mics were so readily available. Kevin Gray has most recently starred as Scar in the National Tour of Julie Taymor’s THE LION KING. Prior to this, Mr. Gray toured the United Kingdom as The King in THE KING AND I, reprising his role from the Broadway revival of Rogers and Hammerstein's classic, in which he became only the third actor in history to play the role on Broadway. Mr. Gray starred as Pontius Pilate in the Broadway revival of JESUS CHRIST SUPERSTAR, and starred in Harold Prince's production of SHOWBOAT as Gaylord Ravenal. He toured as the star of Andrew Lloyd Webber's MUSIC OF THE NIGHT, and appeared as The Engineer in the Los Angeles and Toronto productions of MISS SAIGON, receiving the Dora Mavor Moore and Dramalogue awards for his performance. He appears on THE COMPLETE MISS SAIGON, recorded in London. He was the youngest actor to play the title role in THE PHANTOM OF THE OPERA on Broadway and on the U.S. National Tour, receiving The Carbonelle Award for his performance as The Phantom. Before that, he played Raoul in PHANTOM on Broadway and created the role of Valentin in the world premiere of the musical KISS OF THE SPIDER WOMAN. Kevin first came to the attention of New York audiences for his portrayal of Kayama in the 1985 revival of Stephen Sondheim's PACIFIC OVERTURES, and he was subsequently seen on Broadway as The Prince in CHU CHEM and Off-Broadway in THE KNIFE and THE DEATH OF GARCIA LORCA at The New York Shakespeare Festival, The Young Playwrite's Festival at Playwright's Horizons, and THE BAKER'S WIFE at the York Theatre. He appeared in the pre-Broadway revival of NIGHT OF THE IGUANA starring Jean Moreau, Michael Moriarity, Eileen Brennan, and Roy Dotrice, and in ROMANCE LANGUAGE at the Mark Taper Forum with Frances Conroy, Concetta Tomei, and John Vickery. Other Regional credits include THE REAL THING at The Portland Stage Company, IRMA LA DOUCE at The Goodspeed Opera House, and THE TEMPEST, MACBETH, ALL'S WELL THAT ENDS WELL and RICHARD III at The Boston Shakespeare Company. Mr. Gray also created the title roles in DRACULA THE COVENANT, at the Stonington Opera House, written by Mr. Gray and his wife Dodie Pettit, and Billie Brown's COLORADOS for Paul Giovanni at The Mount Gretna Playhouse. In 1987, he sang the lead in Heitor Villa-Lobos' MAGDALENA in New York, with George Rose, Judy Kaye, Faith Esham, and Jerry Hadley, a production recorded for CBS Masterworks. His musical credits include JEKYLLAND HYDE, A CHORUS LINE, A LITTLE NIGHT MUSIC, THE THREE PENNY OPERA, KISMET, CAROUSEL, GODSPELL, CAMELOT, A FUNNY THING HAPPENED ON THE WAY TO THE FORUM, ONCE UPON A MATTRESS, THE FANTASTICKS, and FIDDLER ON THE ROOF. Mr. Gray's many concert appearances include Carnegie Hall, Avery Fisher Hall, and Alice Tully Hall and he was the recipient of the National Institute For Music Theatre Award in 1989. Congratulations on the CD Kevin! I love the entire album and my favorite is "Why" written by Dodie. Well done! Your album is one of the best I've ever heard. After hearing a short piece of "it's my time to shine", I just had to buy the CD and was blown away by all the other tracks that were on it. You have a great gift of an incredible voice with a lot of feeling behind each song. My favorite is "It's my time to shine"! WOW! well done. Will be keeping an eye out for the next album. Many Congrats! I am French and I had the occasion to see Kevin Gray in L.A. as the Engineer (Miss Saigon). He was simply excellent. This cd is excellent too: I did not know Kevin had a so impressive vocal range. I am a singer too but I am very impressed. He is one of the best artists I have ever seen in the world (and I have seen a lot of them). On cd he is the most impressive in my opinion with Ethan Freeman (Phantom, Jekyll and Hyde, Elisabeth). I loved each track of this album but mostly "Tiny Feet". I first heard Kevin Gray sing in a concert performance of MAGDALENA (Forrest/Wright) with my friend Faith Esham. He was superb that night in the concert performance and I have seen him on several other occasions: KING & I/PHANTOM (as both the Phantom and Raoul)/MISS SAIGON and he is a complete artist both vocally and acting wise. This album is one of the BEST to emerge this year...combing many of the great songs of the musical theatre plus songs by his wife Dodie Petit. Mr. Gray's voice is superb...even showing us his glorious high C at the end of Guido's song and the Hammerstein medley is thrilling for its impact and range.The orchestral accompaniment is magnificent and this is a good standard as to what a Broadway CD should be. Come back to Broadway Kevin!! I first saw Kevin back in 1992 when he was in Detroit playing Phantom and he was the Phantom! His voice and acting had hooked me the first moment I saw him! This collection of music is no exception! Kevin has done a "phantastic" job re-creating the role he made so famous in Phantom as well as the other roles he has played such as The Engineer in Miss Saigon. My two favorite songs are Music of the Night and The American Dream both of which I have seen him perform in their shows - Phantom and Miss Saigon. Haven't had the pleasure of seeing him perform the other songs - however, Kevin's voice needs no show to prove he's got what it takes! I also love his rendition of the "Impossible Dream"!!!! Kevin, you have impressed me as always.....you should do more of these!!!!! !